In iOS 10.2, released on December 12, Apple introduced the new "TV" app, which serves as an Apple-designed TV guide that aims to simplify the television watching experience and help users discover new TV and movie content. 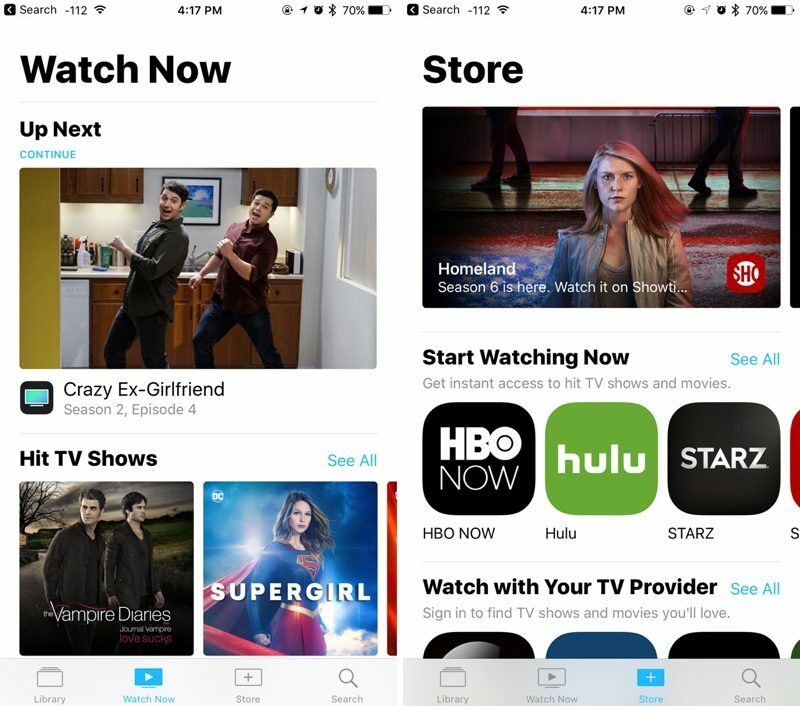 In the United States, the TV app replaces the standard "Videos" app and serves as a television hub on iOS devices, but it appears the new app doesn't work well with content that's been ripped from DVDs. Prior to iOS 10.2 I was able to view video I had ripped on the Videos app in iOS. The process I used was to rip the video and then import them into iTunes. Then I synced my iPhone with iTunes and my movies were download and viewed using the Videos app. iOS 10.2 no longer includes the Video app and the new TV app will not allow me to watch these ripped videos. Does someone have a solution or am I simply missing something? Other iPhone users have been unable to sync home videos and other content to their devices with the current version of iTunes, receiving a message that movies or TV shows can't be synced because the Videos app is not installed. Some users have been able to get around the problem with already-transferred videos by using the TV widget on their iOS devices, which apparently causes the TV app to display the ripped videos after the widget is activated. Others can get the ripped videos to play by setting the videos to be "Home Videos." That the widget allows some users to access their videos suggests this is perhaps a bug that will be resolved in a future update, but it is not entirely clear what's going on with the TV app and content acquired outside of the iTunes Stores. Affected users who want to get non-Apple video content onto their iOS devices will need to use a third-party solution like Infuse or VLC. Ripping DVDs, importing to iTunes, syncing manually to an iOS device. Why not just use Plex already (or another media manager like VLC that allows you to make a local copy wirelessly)? Like we have had to do all too frequently over the past few years; just switch away from Apple's software and use something else (I've had very good luck with Stream to Me and Serve to Me, and no longer use iTunes, Music, etc. etc. for anything at all other than occasionally ripping a CD or manually managing iThing backups and media). That solution also supports playback on various media-players outside the Apple ecosystem (for example, a PS3 will find the Serve to Me server on your network and work properly with it). Unlike Plex, Stream to Me / Serve to Me is extremely simple to setup (it also lacks some of the advanced features, but overall I've certainly been very happy with it). Oh, and VLC will also pick up Stream to Me servers. How do I watch my movies on a plane with Plex? Because moving 200+ GB of files wirelessly takes forever. [doublepost=1484704175][/doublepost]The TV app is a complete disaster - massive number of bugs. and on and on. Apple should put the videos app up in the app store. There's no third party option that plays DRM'd content, so we're stuck. You are ripping it wrong. Great idea Apple, keep incentivizing people to move away from your vertically integrated products to platform-agnostic alternatives. And be sure to keep messing with the value to price ratio on ALL your products! What's the worst that could happen? After all you have so many great new products in the mighty pipeline! This has been incredibly frustrating for me, and it doesn't just affect movies ripped from DVDs. I can't view any movies that I didn't record myself using the phone's camera, including ones created in iMovie. I've tried changing the categories of the video files, creating new movie files using iTunes' "Create iPhone version" function, re-encoding them using HandBrake, setting iTunes to manage music/vidoes manually, etc. This has been an issue for me ever since Apple replaced the Videos app with the TV app in iOS 10.2. This past weekend, I performed a restore on my iPhone out of frustration, and now I can't sync movies at all. Like the post states, iTunes complains that there is no Videos app on the iPhone and that it can't transfer any videos until it's restored. Get it together, Apple, please. With Plex pass you can cache a copy locally within the app (and choose quality while doing so). If you don't want to pay for Plex, you can use VLC to copy files that are visible on media shares. Well sure. But then I have to ask, is there a need to carry 200GB of ripped DVDs around? I don't disagree though that there seems to be quite a mess with the new TV app (though I'm outside of the US so I don't even see it). Apple's ecosystem is deep but sadly narrow. If you don't source, organize, and play your media the way they intend, you're in for an incomplete, fragmented, or kludgy experience. Not all of this can be explained by restrictive studio agreements. For my part, I mostly play end run. I have a huge media library of ripped opticals and purchased digitals, and I use Apple TV almost entirely to host the Plex app as my front end. Ironically, the only issue I encounter is the DRM on movies I bought from the iTMS, which I strip with a completely clear conscience.